Mozilla's Firefox has always been a highly praised internet browser. Since it's open-source, users know what they're getting without any secrecy. It's got plenty of features that are unmatched by any of its competitors on mobile. However, speed and performance have always been a pain point for Firefox, but Mozilla went back to the drawing board to solve this problem with the release of Firefox Quantum. Firefox Quantum is an updated version of Firefox that tackles its performance issues. Quantum consists of several components that optimize the Gecko rendering engine for better speed and performance. When you combine the improved speed with its abundance of features, Firefox easily won our comparison of the best browsers on the Play Store — and the one you need installed on your device right now. Firefox Quantum implements a number of changes that focus on enhancing overall performance. These include better multi-core CPU support, lower memory usage, and a faster interface. However, the most important new component is the Stylo CSS engine. CSS, or Cascading Style Sheets, is the code used to determine the visual layout of websites. Because the aesthetics of sites are a large part of a webpage, improvements to the engine that renders this result in better overall performance. With Stylo, Firefox Quantum is about two times faster than previous versions, resulting in zippy performance all-around. Photon UI is the upgraded interface that improved the look of the browser and made things quicker in general. With Photon, navigating throughout menus and tabs is much quicker than with the old UI. This new UI was designed for improved speed and will keep up with improved back-end performance of Firefox Quantum. Firefox is an open-source browser with a dedication to privacy. Tracking protection is built in to safeguard users against corporations who use trackers to gather information about browsing habits. Firefox also allows users to automatically clear their browsing history and other personal data whenever they exit the browser. A guest session feature allows you to lend your phone to someone without them having access to your saved logins or being able to view your browsing history. With this feature, any browsing data that accumulates won't be stored in your main account. After you conclude a guest session, all data will be automatically deleted. However, Firefox's main advantage in the field of privacy and security comes from its use of extensions. 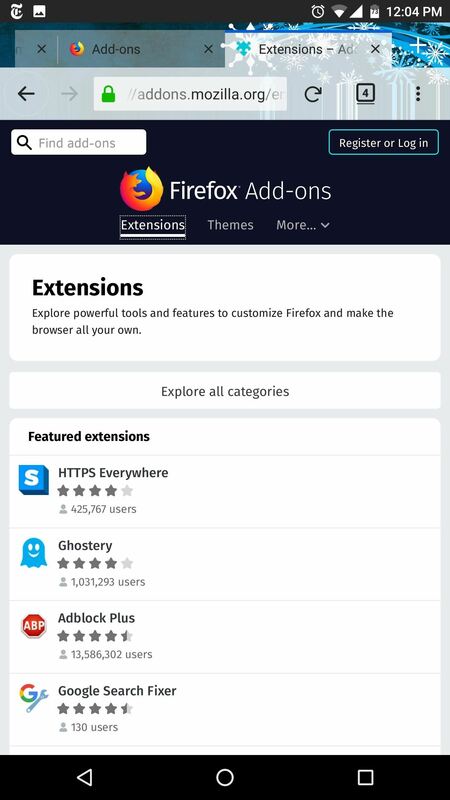 Extensions are like miniature apps that can be added to your browser to alter its functionality, and they can be found in the "Add-ons" menu. Some of the best such tools available are ad blockers. 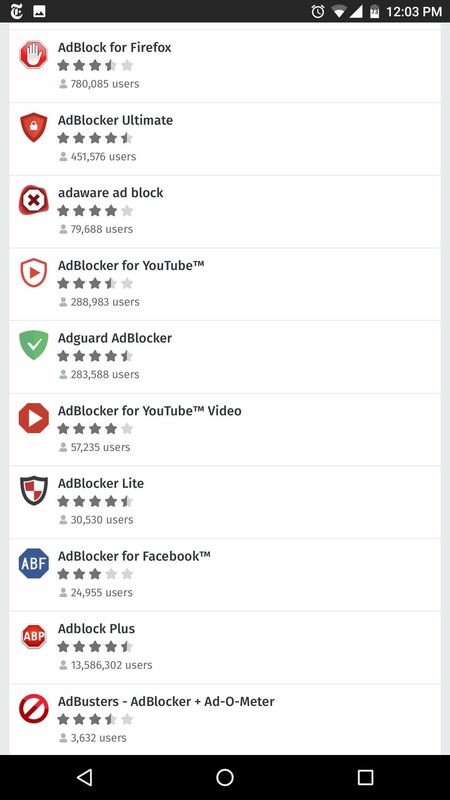 Users can choose from a range of ad blocking extensions that not only remove annoying ads but protect you from vulnerabilities that are associated with adware. There is also an entire category dedicated to privacy that includes many popular and trusted brands. Some examples are HTTPS Everywhere, Disconnect, and LastPass Password Manager. However, Firefox has much more besides the extensions previously mentioned. (1) Some of the ad blockers available for Firefox. 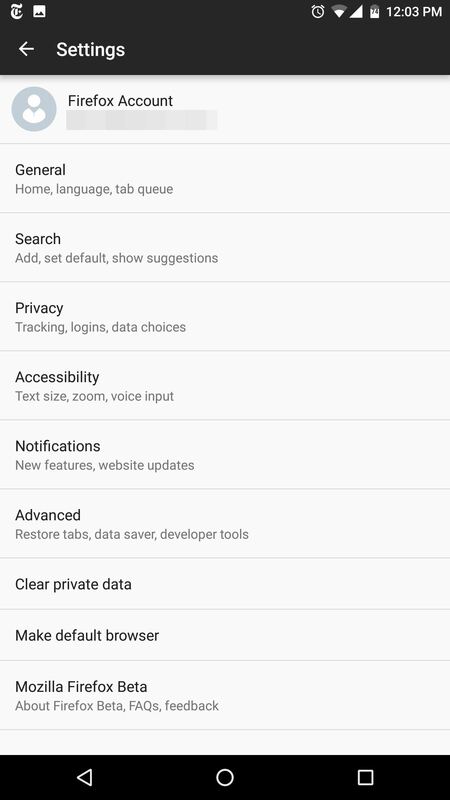 (2) Some of the privacy extensions available. Firefox's extensions are much more than privacy tools. Users can find a broad range of programs which will enhance their browsing experience — better bookmark organizers, RSS readers, and antivirus add-ons are just a few examples of features that users can add to Firefox. 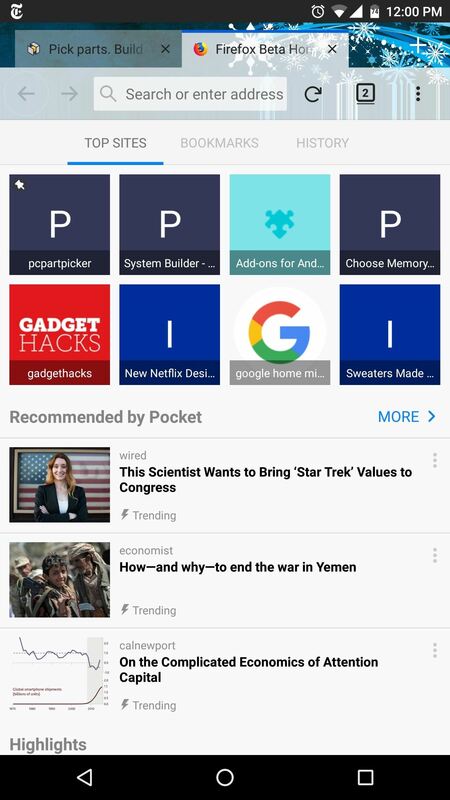 Despite the abundance of extensions for desktop browsers, these add-ons are a rare treat for Android with only a handful of browsers offering the service. 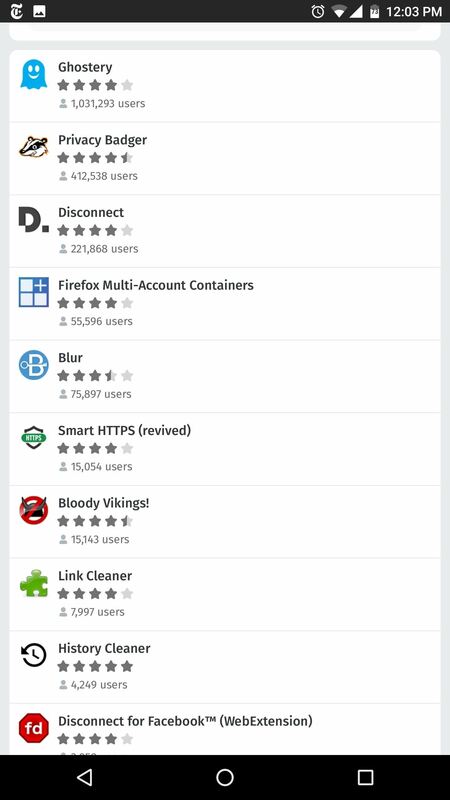 However, no other browser on the Play Store offers has large of a collection as Firefox. 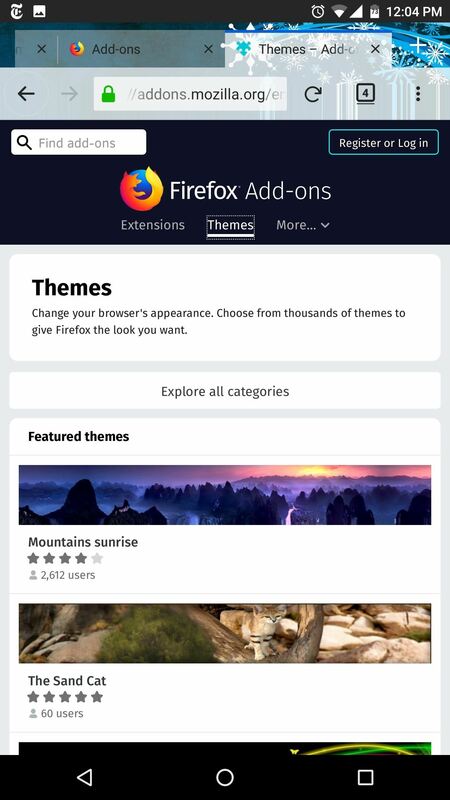 Themes are the other category of add-ons that help Firefox shine. Themes, which are created by users, change elements of the UI, including the address bar and the home screen. Themes allow users to personalize the look of their browser and change its the default view, which sometimes isn't the most appealing. When you combine these elements, Firefox offers an extensive list of features with fast performance. Very few browsers provide extensions, and no other browser on the Play Store can match its variety or its amount. With Quantum's improved performance (especially the Stylo engine), Firefox is now the best browser available and should be every Android user's default browser.